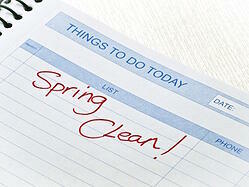 Did you know that the practice of spring cleaning dates back to ancient times? The people of Persia celebrated New Year on the first day of spring, an observance that continues to this day. Persians prepared for this annual rebirth with the tradition of "khooneh takouni", which translates to "shaking the house". While we're not suggesting you take that literally, spring certainly is an opportune time to get your home at Springs Apartments looking shiny and sparkling. Longer days and warmer temperatures provide the energy and motivation for some in-depth cleaning. Just as with any project, your spring cleaning will be more effective with preparation. Use these tips to create a game plan that makes the best use of your time and efforts. Nothing kills your momentum faster than a trip to the store to pick up glass cleaner or disinfectant. Remove that top layer of clutter and trash. This allows you to move on to deeper cleaning without any obstructions. Write down all the major tasks to be completed and enjoy the sense of accomplishment as you check them off. Spring can be a bad enough time for allergies without compounding it by having dusty surfaces in your home. Dust the blinds, vents, light fixtures and all those areas that are generally ignored during the rest of the year. Replace heavy winter blankets with lighter spring bedding. While you're at it, this is a good time to flip your mattress. It saves on wear and tear and you get a better night's sleep. As you go through clothing, accessories and other items that have piled up, set up three boxes or bags marked "Keep", "Donate" and "Throw Away". Be objective when making decisions. If you haven't used it in a year or more, donate it or throw it away. When you clean, move from top to bottom so dirt from above doesn't mar freshly cleaned surfaces. When cleaning floors, remember to start in the furthest corner and work your way toward the door or entryway. Make sure the dishwasher is empty, then fill a dishwasher-safe glass with white vinegar. Place it on the top rack and run the hottest cycle. Follow up by sprinkling baking soda along the bottom and running one more cycle. White vinegar also does the trick for the microwave. Put one cup each of vinegar and hot water into a microwaveable container. Place inside and set the timer for 5 to 10 minutes. After carefully removing the container, wipe the interior down with a wet cloth. Another benefit to spring cleaning is that afterward you can head outside to enjoy the nice weather knowing that your work is done. Do you have any favorite go-to cleaning tips to share?